Connectors - BNC-CCRG6-PK - Only $54.95! 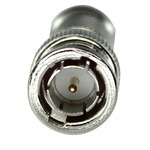 50 pack of compression connectors with a male BNC end for use with RG-6 coaxial cable. Why choose compression over crimp on? 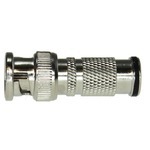 Easy, with a compression connector, you have a consistent, waterproof termination every time regardless of your experience level with crimping, saving you valuable time in the field. Standard crimp type connectors are difficult for first time users to get consistent results, often wasting time and money. Check out our tutorial video here!